This hole occured after the csiva. I think the ches is kosher, since it is still all one piece and has not lost its tzuras ois. Agreed. Should you put a matlis on back to stop it getting worse? if yes, does a future magiha have a chiyyuv to take off the matlis to make sure nothing fishy has occurred? I would recommend putting a matlis to strengthen so that it doesn't tear further. BTW in reality it looks much worse than the photo. if you put a matlis make sure to tell the owner and keep a record for yourself. There seems to be mukaf gvil, but doesn't the fact that there is a hole make it less mehudar? since this is clearly a niceish Alter Rebbe, then the client should be told, no? 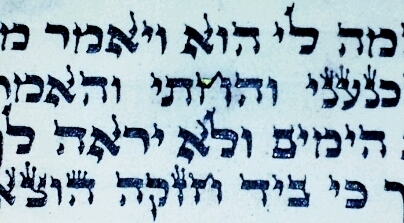 The parsha is by the sofer, he never released it.